The reference implementation for Trusted Firmware has been studied as well as several documents covering boot. To satisfy the requirement of Common Criteria and Formal Verification the design is simplified. The design is balanced between simplicity and required functionality. Another aspect of security is understanding, instead of building generic framework with configuration tools, Secure boot is designed for understanding. 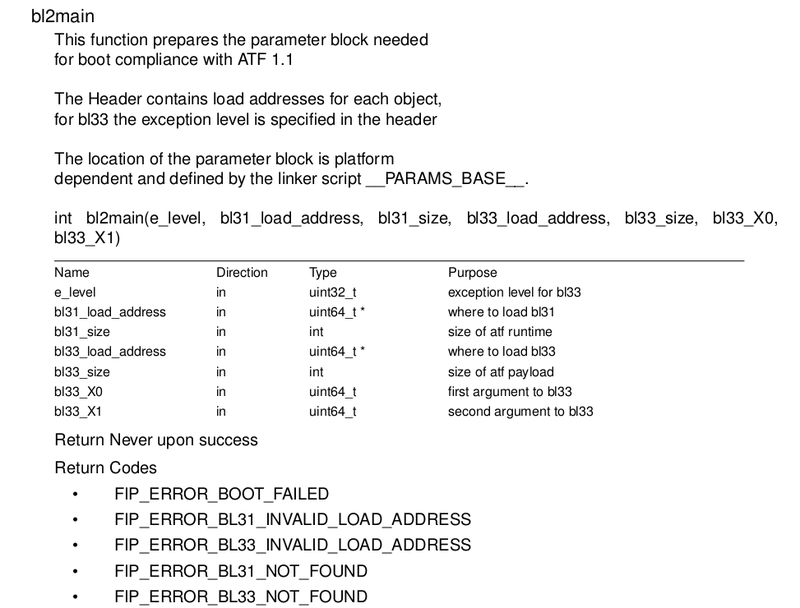 The very first instructions is kept in bl1_entrypoint.S without any includes to simplify security audits. Modern hardware used in smartphones are often multicore systems, with functionality for low energy consumption. Secure boot must therefore manage power on/off for secondary cores after the actual boot sequence. "just load the OS and get the hell out of there"
The product must be described following CC standard. The process of CC evaluation ( EAL-6) is basicly how the documents relates to each other. Semi-formal description of each module, interaction between modules, interfaces of a module. This two interfaces are the only external attack surfaces, attacks against TSFI_COLD_BOOT is remove/insert power cord to the TOE during boot. attack against TSFI_STORAGE is corrupt of badly configured boot images. The FSP Document describes functionality, the TDS document is more detailed about how the modules are related to each TSFI. Combining CC and Open source offers challenges, since CC is document centric and Open Source is code centric. Any change by a external contributor may break the relation with the document. The problem is the integration of content extracted from sourcecode/tools with content stored in OpenOffice/Words. The complete TDS document is found in the source directory, here is just three examples which illustrates how content from different source code be integrated in the same document. Each external interface to security functions ( TSFI ) must be described regarding dependencies to other modules. The build system for Secure Boot is implemented so symbols from the ELF-images could be postprocessed for generating dependency tables. By adding information inside comments in the source code, tools used for agile projects could be applied for CC. The complete TDS document could be found found in the source directory. In the document directory there is some examples of tests that assure that the functionality is correct. Tools for generating document from source code and test results are part of T2Data commercial offering and therefore excluded. The crosscompiler for ARMv8 is included in the repository, but other compilers may work. For development on the Hikey board, USB boot is recommended. Since Secure Boot initially was developed for the Juno Development board, which enable boot from 64 bits mode. The boot ROM in the Hikey board handover the platform in 32 mode, therefore a wrapper is required to change from 32 to 64 bit mode. The same site also contain tools for generate the USB boot image. 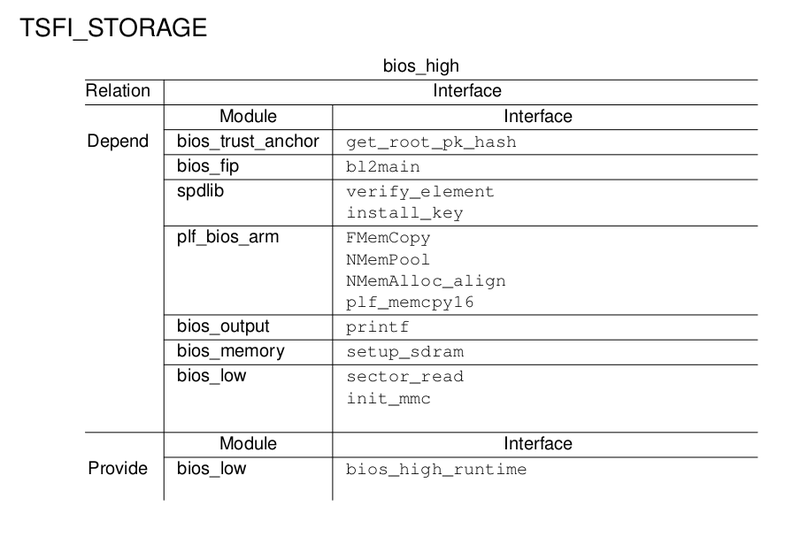 The output from Secure Boot is found in src/bios_arm_build/bl1.bin. A Python tool generates the format required by Hikey Boot. The format starts with a header followed by the wrapper and bl1.bin. Switch to aarch64 mode. CPU0 executes at 0xf9801000! The image is generated by the signer tool, based on a manifest. Since Secure Boot lacks file system, the size of the file MUST be stored inside the image, this is managed by signing in two pass. The boot logic supports file system, but due to simplicity it has been excluded. The image must therefore be stored in a dedicated partition on the flash. The first sector of that partition is hardcoded into the ROM-resident part of Secure Boot ( bl1.bin ). It is important to inspect the manifest, prior to signing, since Secure Boot complete trust the HSBF image. Each section in the manifest corresponds to a object in the resulting image. Note: The two first object MUST be the public key and DRAM configuration. 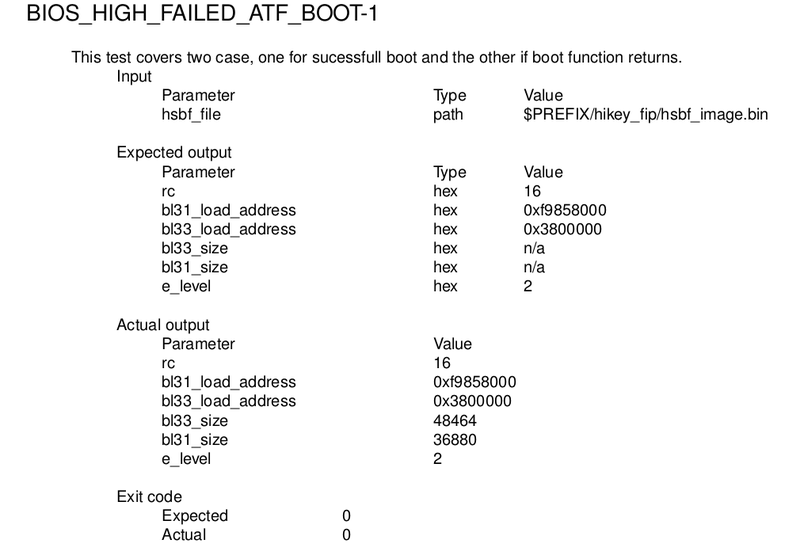 The reason is that Secure boot initially executes in a context with limited amount of SRAM, The ROOT_PK object is verified with the ROOT_PK_HASH ( stored in module bios_trust_anchor). The ROOT_PK is then used to verify the SDRAM object. When mass memory is configured, the entire image is retrieved and stored on memory for later processing. 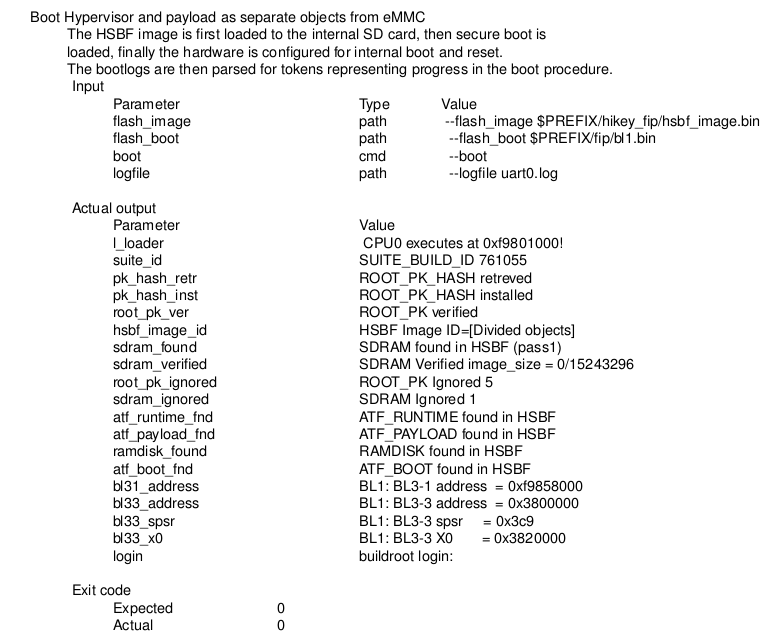 This manifest loads the hypervisor and the payload object ( loaded as ramdisk type). The controll is passed by the final object, that creates a area in secure memory that controls which exception level the payload should use. This manifest is used to invoke Uboot, note that the exception_level is 1 instead of 2. The ultimate goal is to apply formal verification for the entire subsystem, but the model only cover memory and cryptographic library. Therefore traditional tests is required as a complement. The functionality for the boot logic is based on generic modules. The design allows that the HSBF image used for the actual target also could be used for unit tests. The application above is invoked with the HSBF image generated by the signer, the log below is generated and parsed. The logfile is processed and compared against the test specification, finally a test report is generated. The infrastructure required to automate the test cycle involves hardware. debug EMMC boot: send RST_N . The boot log is parsed against a lexical parser, and a test report is generated. 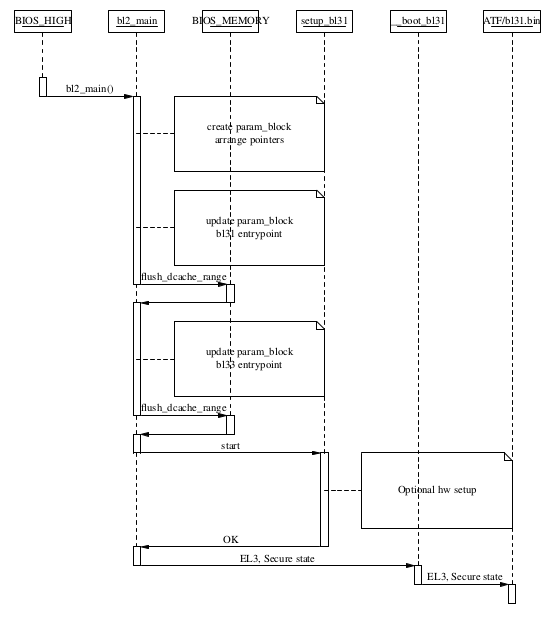 Each module used in this subsystem have licenses attached. As a result of the build process all distributed modules are listed in the legal report. 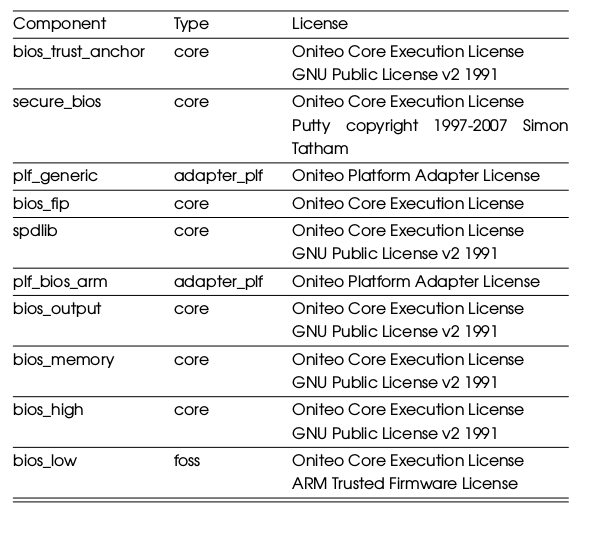 The table below indicates that some modules are under dual license. The legal document contains all licenses.